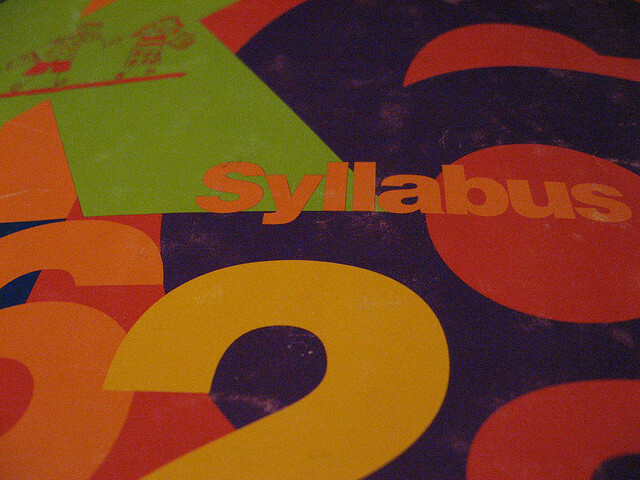 g_kat26, “Syllabus Planning.” April 27, 2009 via Flickr. The AHTR blog hosted a discussion on online syllabi and, very much inspired by Smarthistory’s online syllabus offerings, created a template for an online syllabus for Prehistory – Gothic (here) and Renaissance to Contemporary (here). They’re formatted as a Google Docs Excel spreadsheet for easy editing. You can copy and paste this template to your own Google Doc in order to create a stand-alone syllabus that reflects your survey focus. Your link to the spreadsheet you create can be emailed to students at the beginning of the semester and/or posted to Bboard. If the access is set to “anyone with this link can view” then students can see the syllabus on Google Docs by accessing the link through Bboard, but won’t be able to add or delete. You may be required to teach to a particular textbook, or to teach chronologically rather than thematically. Below are resources for several different types of syllabi that can be “mixed and matched” to suit your needs and teaching specialisms. If you’re a Renaissance specialist, expand that part of the course. If you’re a non-Western specialist in African Art, flip the weekly chronology and begin with non-Western (and contract certain Western topics). This short and smart post by Louise Lamphere Beryl, PhD Candidate in Anthropology and Education at Teachers College, Columbia University, discusses one way to approach syllabus design – “Backward Design,” as touted by educators Grant Wiggins and Jay McTighe.